As we started our first day in Jasper, Alberta, Canada, we spied a beautiful bull elk browsing in the early light. Being careful not to spook the magnificent animal, we gathered our camera gear and moved in place. The light would be very difficult as the sun was just coming up and for us we had the additional issue of the mountains blocking some of the light we needed. This then would be a challenging photographic opportunity in any case but when you considered that the browsing elk was constantly moving, it meant that we would depend on the low light capabilities of the most modern Canon cameras. 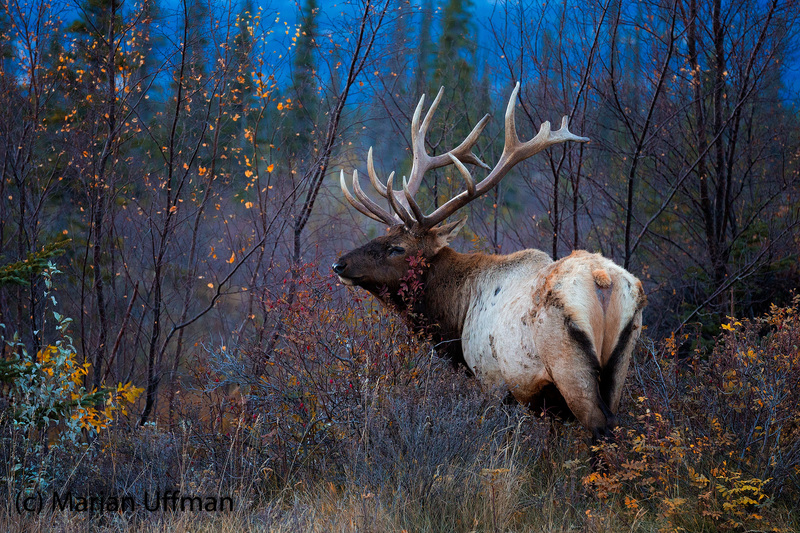 Marian photographed this magnificent elk as it browsed all matter of vegetation using her Canon 5dIII mounted on a tripod with a Canon 70-200 f/2.8 L lens . To tweak the exposure, she set her ISO at 3200 and then used Liveview to tweak the exposure. Great way to start the day and the week in the magnificent Canadian Rockies near Jasper, Alberta, Canada.